Goat is quickly becoming a popular meat in the United States. According to Alliance Nutrition, the demand for goat meat has been on the rise and the supply can't meet the demand. Raising goats for meat has become a lucrative venture. 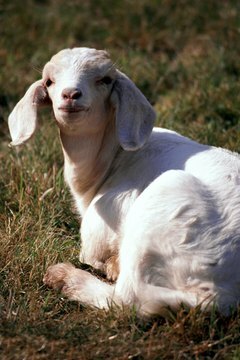 There are a variety of goat species, and two main meat breeds: Boer goats and Spanish goats. Feeding a meat goat can get pricey as they require a variety of feed and nutrients in order to fatten up and provide quality meat. Choose a quality brand of feed grain that is specially designed for meat goats. Ensure that the feed has a high percentage of protein -- at least 14 percent. Start your meat goats' diet from day one. Give kids a proper balance of nutrients to ensure top meat quality when they become adults. Feed weanlings 2 pounds of meat goat feed a day and yearlings 3 pounds. Put your meat goats out to pasture. According to Goat World, Meat goats should obtain more than half of their daily food intake from foraging, or grazing in fields. This isn't to fatten the goat; rather, it's to reduce feed costs so meat goat farmers can turn a profit. Increase the grain feed portions when your meat goats reach adulthood. Feed does 4 1/2 pounds of grain daily and bucks 5 pounds daily. Boer Goats: Why Should You Raise Meat Goats? Goat World; Feeding Programs for Meat Goats; Frank Pinkerton, et al.